3 Beds 4 Baths 1,782 Sq. ft. Description: Beautifully appointed end unit townhouse in the gallery at rivers edge. 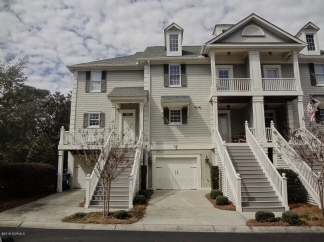 Relaxing on the multiple decks will allow you to enjoy the golfers since the townhouse has a golf course view. Graced with gleaming hardwood floors, this elegant property is perfect for entertaining guests or enjoying your family during those vacation visits. First floor offers a 3rd bedroom with full bath. Second floor offers kitchen, living room, dining area and powder room. Third floor offers master bedroom, master bath, guest bedroom and guest bath. The laundry is also conveniently located on this floor. Maintenance free living at its finest. Enjoy golfing in this pristine community. Amenities also include indoor/outdoor pools, tennis, fitness facility, clubhouse and oceanfront beach house at holden beach.